The good thing about my new job is I get to watch beautiful videos about food. 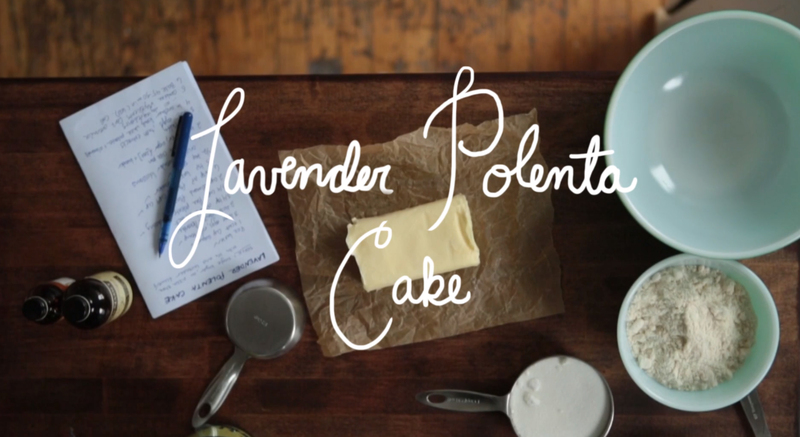 One being from Kate Previte of Brooklyn Kitchen, a short form recipe videos. You can see the video here at a new online channel called Scenic Collection. If you subscribe to the channel and download the app you can make 10 second clips from the videos and share on social media too. 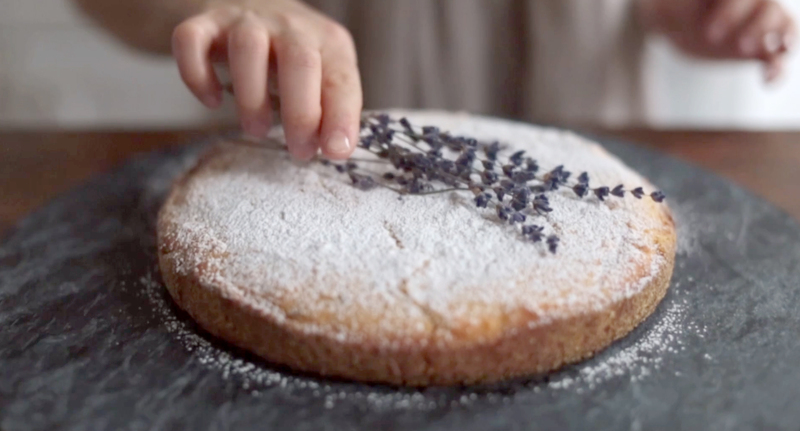 Kate shared the recipe of Lavender Polenta Cake with Scenic and I want to share it with you because it is delicious. If you want to know more about talented Kate Previte visit her website here. Preheat oven to 350ºF (or 180ºC). Butter an 8-inch round cake pan and dust with polenta. By hand or in a stand mixer, beat butter with sugar and lavender until smooth and light. Add the eggs and beat to combine — on low if using an electric mixer — then add the almond extract, brandy and vanilla. In a separate bowl, combine the polenta, almond flour and wheat or gf flour and whisk or mix by hand until uniformly combined. using a sturdy wooden spoon, gradually mix the dry ingredients into the egg and butter mixture until just combined. Spoon the batter into the prepared baking pan and smooth out the top. Bake for 45 minutes, or until a toothpick inserted into the center of the cake comes out clean. The top of the cake should be a light golden brown. Let the cake cool for 10–15 minutes, then remove from pan and allow to cool for 10 minutes more. 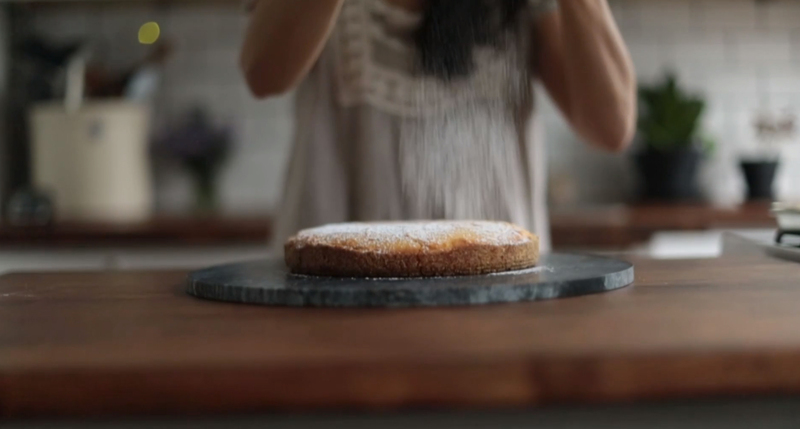 Dust with powdered sugar using a handheld strainer and top with lavender sprigs, if using. Serve warm or at room temperature. The cake will last for about 6 days on the counter if covered in cling wrap, or a bit longer in the refrigerator. *Almond flour can be purchased in stores, but is also a handy by-product of homemade almond milk. After straining your almond milk, spread wet almond meal out on a sheet pan and place in a warm oven (pilot light only) for about 2 days. Grind in a food processor or blender to remove chunks and store in a sealed container in the freezer until ready to use. Your cake sounds wonderful. Thank you for sharing the recipe. I love cakes made without using all purpose flour and this one has very little. Lovely. Thank you. I agree and there are so many nice substitutes to flour. The fragrance in your kitchen while the cake was baking must have been wonderful.